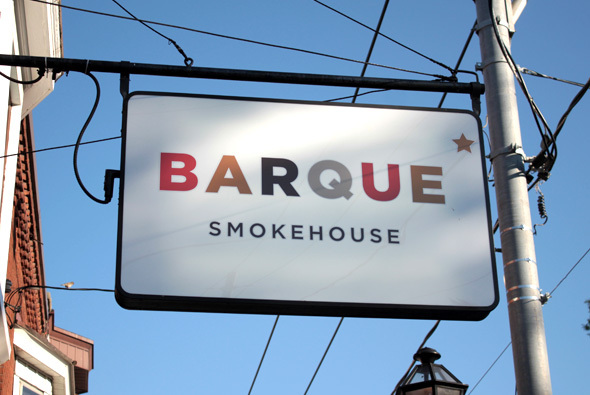 Barque Smokehouse is a new addition to Roncesvalles , located at the corner of Geoffery in the old Bistro 299 space. This casual smokehouse boasts an assortment of classic southern barbecue, crafted cocktails, and seasonal desserts. 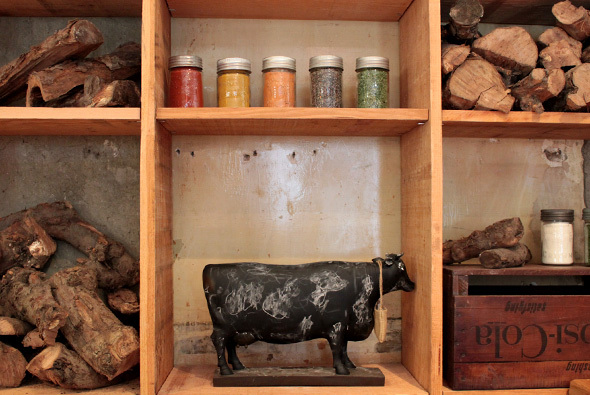 As its name implies, Barque takes a twist on the classics while still remaining true to their flavour. Having made reservations in advance, we were seated promptly avoiding the 15-20 minute wait. Take note: The word's out, so plan ahead! 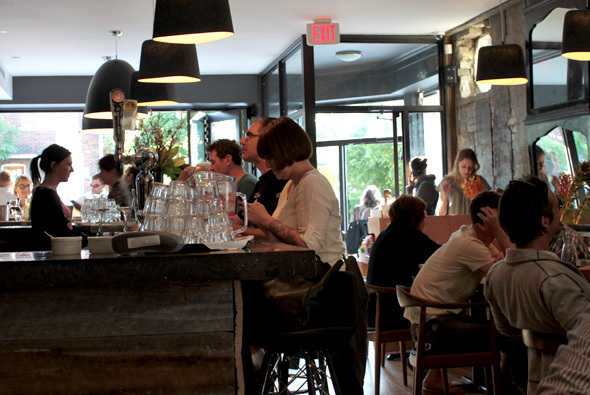 However, bar seating was available and takeout was a popular alternative. Exposed brick, unfinished wood paneling, and mid-century chairs give the space a modern edge without being fashionably uncomfortable - a place for families or even a date. The rotating drink specials were: Smokey Lemon Bourbon Sour ($10), Mint Julep ($9), and a Bacon Caesar ($8). The Lemon Bourbon was like sunshine in a glass. The smokey notes from the brulee lemon garnish brought out the peat of the Bourbon. 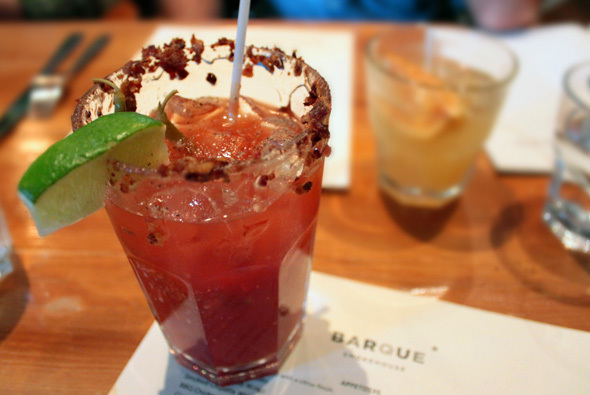 By far though, the Caesar with a honey-dipped-candied-bacon-rim was the crowd pleaser. The spiciness of the Caesar contrasted beautifully with the savoury sweetness of the bacon - a constant juxtaposing flavour found in most dishes that evening. For an appetizer, we decided to try the Brisket Poutine with Veal Gravy ($10). 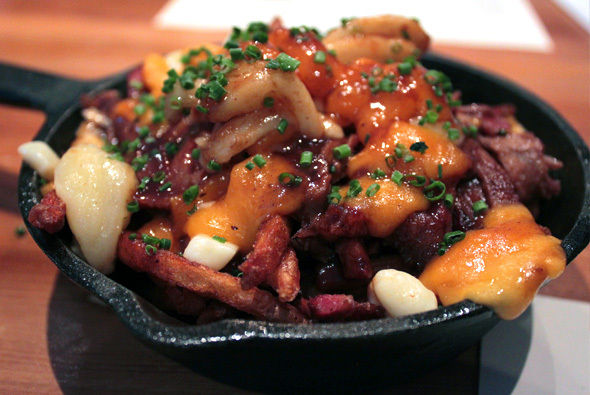 Is it too bold to say that a restaurant can be judged solely on their poutine? If so, it blew us away and by the end of the night they were sold out! The gravy covers your tongue in umami heaven. By adding a sampler option for one ($20) or two ($36), the approachable menu allows you to try a lot for a little. 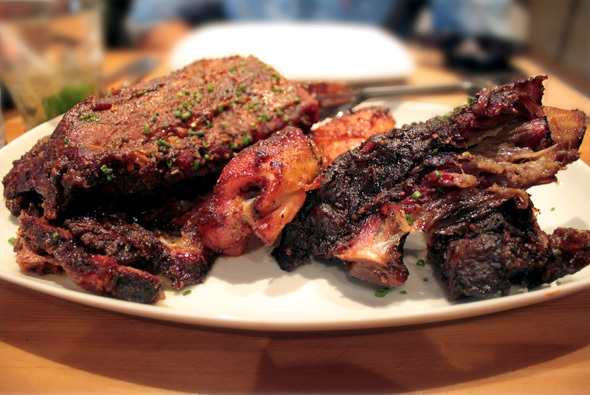 (Choice of three: Spicy Pork Ribs, Brisket, Beef Ribs, or Chicken Thighs.) The server implored us to get the chicken - but who gets chicken eating out, right? WRONG! The chicken was succulent, needing no sauce. The beef ribs were covered in a caramelized smokey bark (or should I say barq) and was my favorite by far, although everyone else preferred the chicken. I found the brisket braised beyond recognition and the peppercorn marinade lack luster. The pork ribs were a tad dry but the spicy rub was like crack. For sides, definitely try the Pickle Platter ($4). The sourness is a great palate cleanser balancing the savouriness of the meats with the sweetness of their sauces. 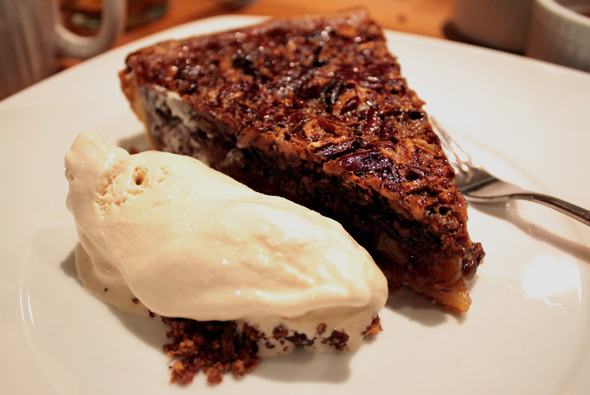 In keeping with its southern roots, a slab of housemade Pecan Pie was in order, with a side of Greg's famous Roasted Marshmallow Ice Cream. Not really a Pecan Pie eater, but I found myself scraping the plate. Barque is the perfect welcome to summer and now with brunch on the weekends you have even more opportunities to try it out.